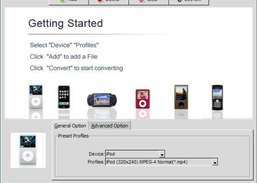 Key features: Convert popular video formats to Apple iPod Video. Convert popular video formats to Sony PSP. Convert popular video formats to Microsoft Zune. Convert popular video formats to MP4 format that can be played on general portable video device, such as Archos, iRiver, or Creative Zen Vision, or other MP4 player. Converting in batches, convert multiple files at one time. 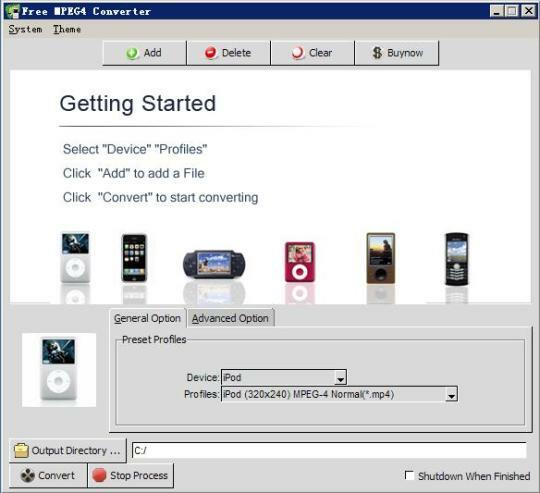 MPEG4 Converter allows you to load all video files you want to convert, then click "Convert" button to convert them... Support most popular video formats, such as AVI, MPEG, MPG, MOD, WMV, MOV, QT, MP4,DivX, XviD, ASF, MKV, DV, AVS, 3GP, 3G2... Easy to use - Just two clicks, everyone can become the master of Mpeg4 Converter. Automatically shutdown the computer after conversion. High speed - A two hours long movie can be convert into a MP4 movie with high quality within one hours. Many settings are adjustable, such as video size, bit rate, frame rate. So that the output MP4 video wil match most portable media player, such as Archos, iRiver, Creative Zen Vision.